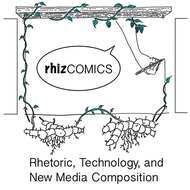 Rhizcomics is a digital monograph that composes multimodal arguments about rhetoric and comics. The book presents comics as a rhetorically complex medium capable of nuanced scholarly arguments. Relying on animation, drawing, video, interactivity, and text, Rhizcomics investigates presymbolic rhetoricity across comics and other media. It differs from most books in its organization and argumentation. Like most books, it can be read in many orders (I often begin reading a book in the works cited and then move to the table of contents). Also like many books, it offers a scholarly argument and attempts to persuade its reader using evidence and citing other authors where appropriate. But Rhizcomics’ organization is a little different. Some of its reading orders have been programmed into this book. There is a “right” way to read it. There are also many other ways to read it that have also been programmed in. A print book offers suggestions for reading order (page numbers that gradually increase, chapter order, indices). Rhizcomics relies on digital logics for those orders. Digital logics can be a bit more pushy than print logics. So much for the supposed freedom of electronic literature. You just viewed Rhizcomics. Please take a moment to rate this material. If you know the author of Rhizcomics, please help us out by filling out the form below and clicking Send.